Trouble viewing? View this email in your browser. 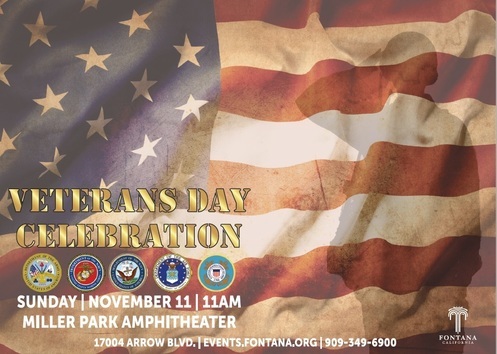 Fontana, Calif.- Give thanks to the brave men and women that dedicate their lives to serve our country and protect our freedom during the Veterans Day Celebration on Sunday, November 11, 2018, at 11:00 a.m. at Miller Park Amphitheater (17004 Arrow Blvd). The ceremony, beginning at 11:00 a.m., will feature guest speakers from Fontana Middle School, a Blue Star Mother, numerous military ceremonial traditions, and a special musical performance from the Kaiser High School Band. The winners of the Dr. Charles Koehler Writing and Art Contest will be recognized, in which winners will read their essay or poem expressing the theme: “What Veterans Day Means to Me.” The winners of the art contest portion will also take the stage to display their illustration of the theme: "What a Veteran is to Me." For more information about the celebration, please call (909) 349-6900 or email events@fontana.org. We understand that our community uses several different means of receiving news and information. The City of Fontana Social Media team provides several ways of receiving news, tips, and information online. Please visit our website or follow us on Social Media for the latest City related information.